Bernard Hopkins last night became the oldest boxer in history to unify belts in a weight division at the DC Armory, Washington, USA. At the ripe old age of forty-nine Hopkins added the WBA light heavyweight crown to his IBF belt by out-pointing Kazakhstan’s Beibut Shumenov. The fight controversially was scored as a split decision with two judges finding it 116 – 111 in favour of Hopkins and the third 114 – 113 for Shumenov. A scorecard that in no way reflected the ageless Hopkins dominance. Hopkins took the fight from round three onwards and even nearly scored an unlikely knockout victory flooring Shumenov with a hard right hand in the eleventh. Shumenov managed to rise off the floor but Hopkins deservedly got the nod to improve his record to 55 (32)-6-2 and two no contests. Shumenov falls to 14 (9)-2-0. On the undercard Shawn Porter 24 (15)-0-1, retained his IBF welterweight title by stopping two-time former world champion Paulie Malignaggi 33 (7)-6-0 in the fourth round. 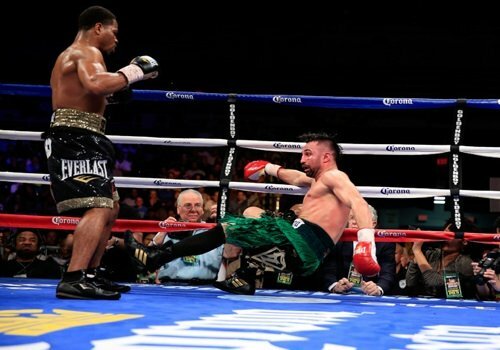 Porter knocked Malignaggi to the canvas in the fourth from a vicious assault after a dominant performance, leaving the referee no choice but to call a stop to the contest. Shawn Porter is now set to face unbeaten British fighter Kell Brook as his is the mandatory challenger for the IBF belt. Peter Quillin 31 (22)-0-0 also retained his WBO middleweight belt dominating and defeating the overmatched Lukas Konecny 50 (23)-5-0. Quillin won by scores of 120-108, and two 119-109 cards. The win although dominant was less than impressive with Quillin unable to finish his opponent and appearing to do just enough to win.